SPS provides excellent environment and a set of practical tools for stowage planning of general or break bulk cargo. 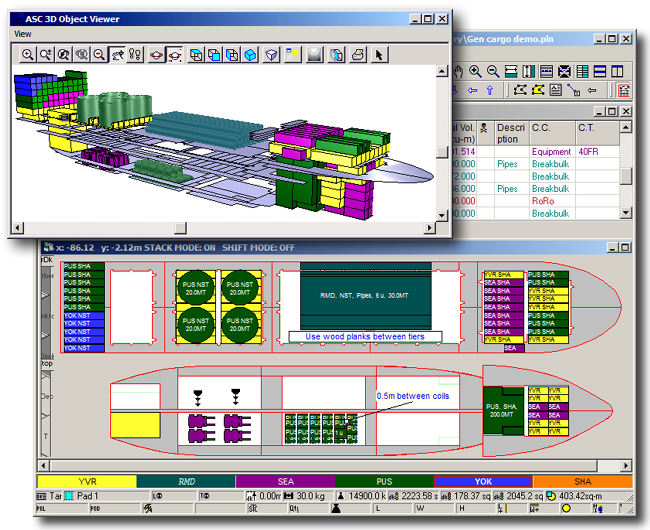 All cargo planning is performed in a single screen, in which the user drags cargo items from the Cargo List window to a graphical plan. When cargo is transferred from the Cargo List table to the plan, SPS renders its image based on the type and dimensions of the cargo units. The user can monitor current stowage arrangements in 3-D isometric view in real time. There he can setup components of the ship's structure to be visible, transparent or hidden to don't obscure cargo stowed in holds. Normally SPS works with primitive shapes such as box, cylinder and pipe. In addition to that the user can create any odd-shaped units of any form. As soon as cargo is rendered in the plan, the user can move and rotate it at any random angle to put in exact desired position. Snap-to-grid and snap-to-cargo functions assist in proper positioning of cargo units. There is a set of automated stowage tools that facilitate the process of stowage planning of mass cargoes. The user can stow multiple units in a selected area in a hold or on a deck following customizable stowage rules, he can stack cargo units vertically, or stow cargo by stowage factor where it is practical. SPS performs automatic checks of stowage limitations and possible stowage conflicts in all ports through the entire voyage. All detected conflicts are highlighted on the plan with the user being able to disable the alarms. If the ship is equipped with moveable tweendeck panels the user can set them up at desired heights and positions. SPS will automatically adjust free heights in holds and centres of gravity accordingly. 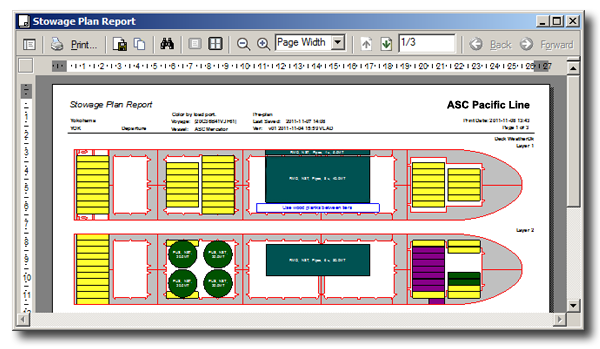 The user can customize the cargo information shown on the plan separately for different types of cargoes and individually for the screen display and printed reports. 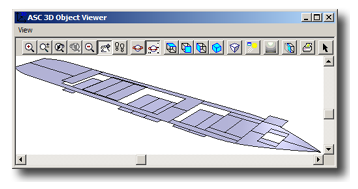 With a number of drawing tools the user can enhance informational content of the stowage plan adding lines, arrows and comments. When SPS is linked to the Autoload hydrostatic module, the user can monitor in real time parameters of ship’s stability and floating status when stowing and moving cargo around the plan. Real-time feedback of stability parameters and floating status from Autoload, the hydrostatic module. Contact us for more information and to schedule a live demonstration.